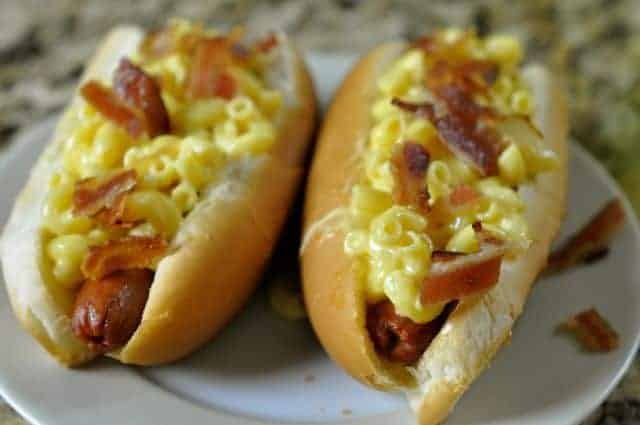 This Truffle Macaroni and Cheese Bacon Hot Dog was inspired by a recent trip to Disney. I have friends that are Disney fanatics. Vacationing is often spent at Disney parks and on their cruises. They have a way of knowing where the good food is as Disney. This hot dog was amazing, and here is my recreation of this dish. For this recipe we are using truffle oil, truffle oil can be purchased in some specialty stores, and some grocery store spice departments. I buy mine at Costco. I think that Costco’s brand is well priced, it runs under $15.00 dollars a bottle. Truffle oil has many uses later, you can drizzle in a pan and cook a steak in it, drizzle over potatoes, or if you are cooking mushrooms it is a great addition to add to the mushrooms for a little extra flavor. Now, if you don’t have truffle oil, or can’t find it, you can still make this recipe. You will get the fun of putting macaroni and cheese on top of a hot dog. If you have never tried truffle oil before it adds a unique mushroom like flavor. I don’t know how to describe it, it is like a really earthy mushroom, but better. Truffles are insanely expensive, and rare. So typically for us mere mortals, truffle oil is a great way to capture this flavor without having to pay the price of a real truffle. I do suggest that you buy your truffle oil from a reputable brand, as some companies sell fake truffle oil. For this I went ahead and baked my bacon. I find this easy to do, it doesn’t make a mess, and you can always save that bacon grease for some Cracker Barrel Green Beans. I like to cook my bacon to where it is pretty crispy for these hot dogs, I think it adds a nice touch to them, no one likes soggy bacon, well almost no one. Disney is known for their inspirational foods. Truffle Macaroni and Cheese is layered on hot dogs. In a small pot heat together American cheese, and half and half, stir continually until sauce a smooth and creamy texture. Add truffle oil into macaroni and cheese, blend oil into the cheese sauce. When pasta is done pour pasta into the cheese sauce, coat pasta with cheese sauce. Cook or warm hot dogs. Place hot dogs into buns, and then spoon a couple of tablespoons of macaroni and cheese over hot dogs. Add crumbled bacon on top of macaroni and cheese. oh my goodness. Pinning this one to my “top dogs” board. Ahh thanks 😉 I thought it was a pretty unique hot dog. Thanks for the pin!